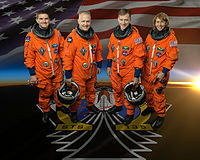 Pictured in the STS-135 crew portrait are NASA astronauts Chris Ferguson (center right), commander; Doug Hurley (center left), pilot; Rex Walheim and Sandy Magnus, both mission specialists. STS-135 (ISS assembly flight ULF7) ni iranlose ipari Oko-alobo Ofurufu awon ara Amerika. Iranlose na gbera ni 8 July p si bale ni 21 July 2011. ↑ "Launch and Landing". NASA. Retrieved 2011-07-01. ↑ 3.0 3.1 "NASA - Landing". NASA. Retrieved 2011-07-21. ↑ "Consolidated Launch Manifest". NASA. Retrieved 2011-06-10. ↑ Bergin, Chris. "NASA managers approve STS-135 mission planning for June 28, 2011 launch". NASASpaceflight.com. Retrieved 2010-08-20. ↑ "Obama signs Nasa up to new future". BBC. 2010-10-11. http://www.bbc.co.uk/news/science-environment-11518049. Àtunṣe ojúewé yi gbẹ̀yìn wáyé ni ọjọ́ 10 Oṣù Kẹrin 2017, ni ago 22:04.